There are a lot of fun holiday traditions surrounding Christmas. My personal favorite is the ugly Christmas sweater. According to Reuters, ugly sweaters are a hot trend this holiday season. But let’s be honest: Finding the perfect hideous pullover can be harder than it sounds. 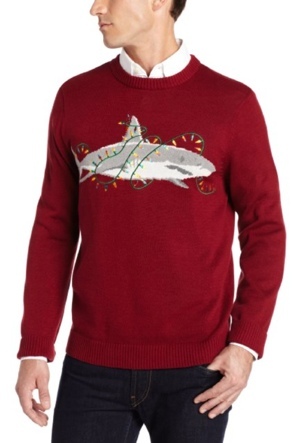 Thankfully, this year, Amazon makes finding that perfect ugly sweater simple. The online supersite has created an Ugly Christmas Sweater sub-category, filled with eye-melting designs and head-shaking graphics. Sure, you could go with a more traditional ugly giant Santa face. Or, you could shake things up a little: How about a holiday pullover that actually lights up? Or a maybe you’d rather wear one with a vomiting reindeer? Most sweaters are priced around $29.99, which means you’ll have to throw a little something extra in your Amazon cart to qualify for Free Super Saver Shipping. Or, of course, you could sign up for a free trial of Amazon Prime – free 2-day shipping is something I highly recommend for the holiday season. You can take a look at Amazon’s wonderfully terrible collection here.